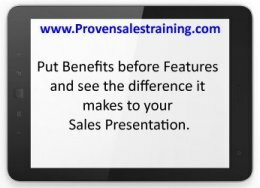 Put benefits before features for an effective sales presentation. In your sales presentations to customers do you present features or benefits first? Most traditional sales training advises features first, followed by benefits. But is that the best and most effective way to give your sales presentation? Have you actually thought about which way round will get the best results, or do you do as it has always been done? When we publish your advert on our website we also promote your vacancy online via social and business media, and we send it to our data base of 500 independent sales agents. That means we get it in front of hundreds of additional people that don't regularly visit the website. The first sentence is the feature of an advertising sales presentation for a business I'm involved with that advertises for sales agents in the UK. The feature tells the prospect what we do. It informs them that as well as publishing their advert for a sales agent on our website we also promote it in various ways. The second sentence is the benefit, to the prospect, of that feature. It presents what they will gain from the feature. In this case the benefit is; their advert will be seen by hundreds more people as a direct result of the feature stated. In everyday conversation this is the normal way to communicate, point of reference first, start with the cause, and how you got the benefits, these all helps to tell a story. But in a sales presentation both you and the customer know that you're talking about the product so is there a more effective way to communicate? Which is more important, which should be first..? My opinion is that the benefit is more important than the feature and it should be presented first. The benefit is what sells your products and services and it's what the customer wants to hear. The feature is only what delivers the benefits, so for me it's benefits before features. We get your advert in front of hundreds more people because when we publish it on our website we also promote it online through social and business media, and we send it to our data base of 500 independent sales agents. The benefit, of getting the advert in front of hundreds more people, is right there at the front. It's the important part of the sales message. How that benefit is delivered is presented afterwards as a way of explaining how we are going to supply the benefit. Should it always be benefits before features..? This sales technique is very effective in short presentations, retail sales, products with just one selling point, and pure presentation sales such as market stalls or fairground pitches. You're hitting the customer with the benefit first, not an explanation of a feature, or how the product works to supply the benefit. If part or all of your sales presentation is via the written word this technique is a must. The benefit is the headline and the headline is always first. If it's buried away in the copy lower down the reader skips onto the next thing that catches their eye and you lose the sale. This sales technique works well in emails, it gets straight to the point for busy people. If you're presenting a product with a lot of features and benefits your customers can get bored. Keep your customers interested by hitting them with benefits and then telling them, briefly, how your product will supply the benefits. In your next sales presentation move your benefits to the front and follow with features. In your next email to a customer tell them what you and your products will do for them before you tell them how you will do it.